Literature and other art forms can be important tools that individuals can use to address pluralistic ignorance within society. People often are afraid to go against social norms because they fear being ostracized, or maybe they just don't even question it. Literature and art can be used to encourage people to think for themselves to feel more comfortable expressing their dissenting opinions because they know they aren't alone. This can be a catalyst for change within society. Here is a kind of annoying youtube video explaining pluralistic ignorance. Pluralistic ignorance is a pretty unnerving concept. It's the same idea that leads to crowds being an easier place to commit a crime because no one will take action because each is assuming that someone else will. I love the idea of literature and art being ways to prevent pluralistic ignorance in society. The pictures you used were awesome in aiding your writing! I also really loved how you addressed literature as a way to express yourself in order to stop the problem of plural ignorance. That's a great way to view literature. It's really scary how pluralistic ignorance can work! It is almost like a herd mentality. I love the pictures you included. Your blog post was hilarious! Your blog post was hilarious! 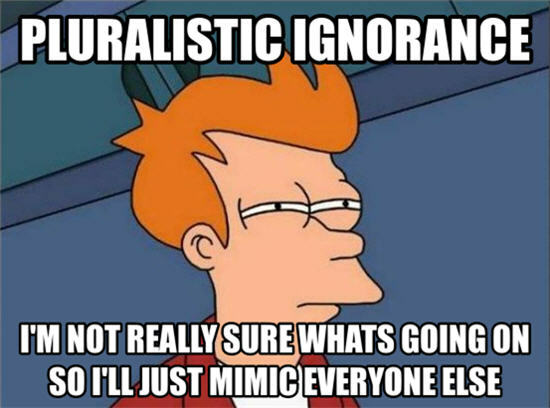 Pluralistic ignorance is something to address because its a real problem in the world today. However, I think its awesome that you can tackle an issue like this with a sense of humor. Cool!